It all started with the plastic chicken. There was a knock at the front door, and there stood a handsome blond man holding a blue carrier bag. A red Fiesta was parked at the kerb. ‘Yer Nifty-Ware order, bab,’ he said. Wow, I thought. ‘Says P Martins on the order slip,’ he offered. ‘Pete!’ I called out, ‘Someone at the door for you!’ I stepped back as Pete bustled up. I went into the kitchen and flicked the switch on the electric kettle, thinking I’d make myself a cup of coffee and then retreat back to Facebook. I heard Pete talking to the guy, and then the front door shut. He came in to the kitchen and took a plastic chicken out of the bag and placed it triumphantly on the worktop. ‘I thought you could do with it, as you’re working such long hours now.’ It was true, after Pete had been made redundant I had started working a nine hour day, and taking sandwiches and snacks to work was a lot cheaper than buying them from the canteen. After three years in a relationship, our plans for buying our own place, getting married and starting a family were on hold indefinitely. ‘So how much is all this costing?’ I asked. ‘£24.98,’ he said, ‘but don’t worry, I’ve still got some of my redundancy money left.’ I decided not to comment. Over the next few weeks, plastic objects started to increase in the house. I came home from work and poured milk in my coffee only to find a new kind of spout attached to the carton. ‘It avoids spillage and helps you to control the amount of milk you use more precisely’ said Pete. How does that unconscious attraction start to build between two men? I imagine physical closeness that becomes too much before they realise it, heads close over the catalogue, Pete breathes in Barry’s aroma of cigarette smoke, sweat, and expensive aftershave. He asks him what makes him do it, how he makes his money, he must see a lot of bored housewives, but Barry says quietly he is not interested in that. Pete studies the lines of Barry’s face, strawberry blond hair, blue eyes fringed with black lashes, the neat polo shirt embroidered with the Nifty-Ware logo, its open collar hinting at a smooth chest. ‘Look’ says Barry, ‘have you ever seen anything like this? It’s my best-selling item. It’s gotta be the best deal in the whole catalogue.’ Barry points with a broad, well-manicured finger at the catalogue, but Pete is staring at him open mouthed. ‘I’ll take three,’ says Pete. ‘It’s a set of four,’ says Barry. ‘OK, four,’ says Pete and finally they lock glances, Pete’s lower lip is quivering with a nervous tic. The Nifty Ware Distributors Training Course is being held at the Stockport Motorlodge, a purpose built two storey concrete building set amongst car parks and landscaping. There is a reassuring standardness about the simple geometric interior with its duplicating decor. They are to share a twin room, and wheel their lightweight luggage sets along the soft carpet of the corridor. Barry slides a card into the door lock and they go in. The curtains are still drawn and the twin beds are two doubles pushed side by side, the covers turned down. Pete got very absorbed in the Nifty-Ware business after coming back from the training conference. He was always out, distributing catalogues, collecting and delivering orders. He saw a lot of Barry. The lounge always seemed to be full of blue plastic bags containing clever gadgets, cleaning solutions. And then, of course, I came home from work one evening and he was gone. The ultra-lightweight wheely suitcase with matching laptop skin had gone, the travel bathroom organiser which unrolled cleverly to display toiletries had gone, even his passport, in its vinyl embossed holder with a convenient rear compartment for boarding passes, had gone. I didn’t feel sad, actually – I wasn’t sure what I felt. I discarded the two-compartment microwave bowl and its congealed contents in the ergonomically designed bin, and dialled a take-away. Over the next few weeks I spent longer at work, there was no urgency now to get home in time for supper, and there was less traffic if I left before the morning rush hour and came home late at night. The working day seemed less rushed, because I had longer to get my work done. It was the weekends that dragged. Friends seemed to be avoiding me, and I felt less valid in their eyes as a newly created singleton. All our friends had been couples. I never seemed to go away for the weekend, and roast dinners weren’t the same. I couldn’t listen to my favourite songs any more, the lyrics kind of hurt. I started to surf the internet looking at the dating websites. They reminded me somehow of Nifty-Ware, and I stopped. There were advantages, of course. Now that Pete had taken his stuff, a lot of the clever space-saving devices could be discarded. I threw away the over-the-door garment hangers, the bathroom storage holders held up with rubber suction pads, and the thoughtfully designed rubberwood shoe rack that held twenty pairs of shoes in a space for six. I started off telling him that he couldn’t just move back in like that, what did he take me for, did he think I was stupid, and anyway I couldn’t put up with the thought that he’d been up to all sorts of tricks with another bloke. But he looked so exhausted that I said he could sleep on the sofa for old times’ sake. And no more Nifty-Ware either. He stood his suitcase in a corner of the living room. ‘Is it OK if I have a cup of coffee?’ he asked. Over the coffee, I asked him what went wrong with Barry. He looked down then, tears rising. ‘I’m sorry Ellie,’ he said, ‘it’s – I just can’t talk about it.’ And we left it at that. Could I take him back? My friends said no, of course. And I wondered if there was something else in his story. Pete seemed haggard, vague, as though he had lived through a traumatic experience. Surely a few weeks spent in an obsessional household could not have been that traumatic? Anyway, he stayed in the living room for a few days, appearing reluctant to go outside. A few days later, there came a knock at the door. A couple of men showed their IDs – plain clothes policemen. They wanted to know the whereabouts of Peter Martins, wanted for questioning in connection with the death of Barry Malahide. Barry had, it transpired, been knocked unconscious with a blow to the head from a ceramic-coated non-stick cast-iron frying pan, and whilst unconscious, his head had been placed inside an easy-seal freezer bag, resulting in suffocation. Afterwards his body had been placed in a super-large airtight duvet storage container, so it had been some time before the neighbours in the flat below started complaining about the smell. I told the police what I knew, showed them the note, but I don’t think they managed to get hold of Pete before he left the country. All characters and household products are fictitious, and any resemblance to any persons living or dead or any genuine household products is entirely unintentional. What a brilliant touch of kitch advertising-obsessive male single mindedness you have woven into this rather dark tale of gadgetlit, Giselle, well done. I can see Barry becoming the dictator of a very clean S. American country. Whoa! This is an entertaining read giselle – I love the gadgets described in a droll manner – hilarious! Bravo! Please accept this limited edition commemorative Titanic ballpoint pen and propelling pencil set in celebration of your writing achievements! 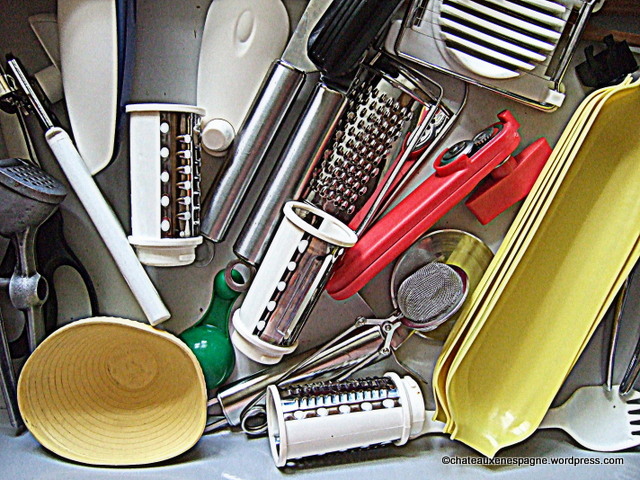 The irresistible march of labour saving household gadgets. It’d take a braver man than me to confront that. I liked this story very much, easily read, well written and cleverly intertwined with the gadgets.